Spider mites lurk under leaves of plants in greenhouses, gardens and fields where they may cause extensive damage to the leaves of plants and trees. The reason spider mites seem to live everywhere involves their small size and the large number of host plants on which they eat and lay eggs. A variety of mites, known as hot-weather mites, include the two-spotted, European red, honeylocust and oak spider mites thrive in areas with hot, dry weather. Cold-weather mites include the spruce and southern red spider mites. These mites prefer cool spring or fall weather. 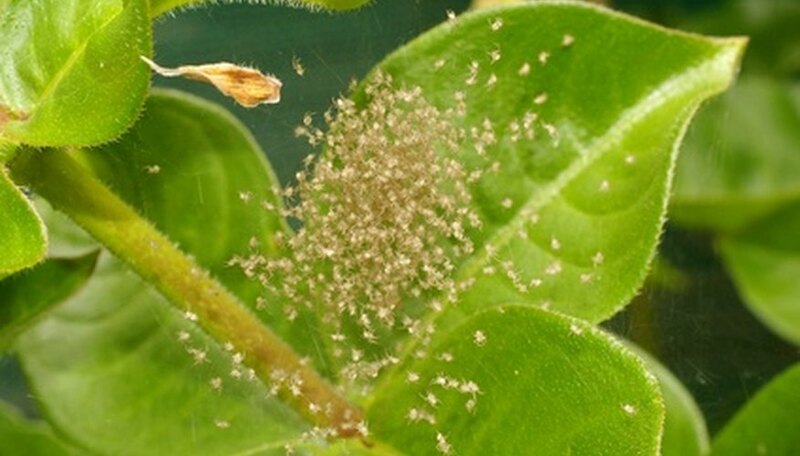 Hot-weather mites, such as the two-spotted spider mite, lay as many as 100 to 200 eggs on the undersides of leaves on one of approximately 180 host plants. Host plants include field crops, ornamental plants, weeds or house plants. The eggs take up to 20 days to hatch, although they may hatch in just a few days if the weather cooperates. Cool-weather spider mites often spend the entire winter in the egg stage while attached to the host plant. The eggs begin hatching in the spring. The spider mite eggs hatch into tiny larvae with rounded bodies and three pairs of legs, a stage they stay in for several days while they rest and feed. Next, they molt into a nymph with four pairs of legs, resting and feeding before molting into a second nymph stage. Within a few days, the second-stage nymphs became adults. The entire process from egg hatching to adult stage takes between 7 and 14 days. Adult spider mites sport four pairs of legs extending off a single, oval body. Female spider mites have rounded abdomens while males have pointed abdomens. Some mites, such as the clover mite, only live for a few weeks as long as weather conditions stay in their favor. Female two-spotted mites often live longer, spending the winter in a protected spot. Spider mites feed by piercing plant tissues with their mouth parts, then sucking out the plant fluids. They usually feed on the undersides of leaves. The leave started to look mottled or speckled in appearance once the mites infest the leaves. When large numbers of mites attack leaves, the foliage becomes webbed. To find spider mites, look for plants with injuries on their leaves. Then use a magnifying lens to identify the mites, which grow to 1/50 of an inch in length. Sometimes spider mites coat the foliage with fine silk webbing that catches dust, making the plant look dusty or dirty. Detecting spider mite before damage takes place works as the first step in controlling the pests. One method of control includes the use of strong jets of water to knock the mites off plants. The use of beneficial mites, including Phytoseiulus persimilis, also helps eliminate spider mites. Other predator insects such as ladybugs and lacewings also work to rid crops of spider mites. Otherwise, insecticidal soaps and oils or pesticides are options to rid plants of mites, although they are somewhat resistant to pesticides.